We are delighted to offer Denplan Care and Essentials, meaning there is a dental care plan to suit every oral health need and budget. Supporting a preventive approach to dental care, you will have access to regular bespoke dental care with your preferred dentist & hygienist, helping to keep your teeth and gums healthy and prevent problems in the future. 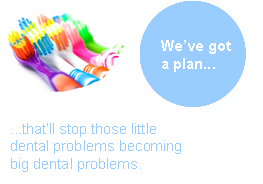 – All your Preventive oral health care included, to help stop dental problems before they start. – Your preferred dentist at time convenient to you, wherever possible. – Predictable monthly payments, allowing you to budget for your bespoke dental care. – Attractive Discount off treatment fees of up to 20%. With 6500 member dentists to support you accross the UK and around 1.7 million patients accross the countrly, Denplan is the UK’s leading dental payment plan. For any questions, just contact the practice on 01292 268880, where we will be happy to advise.